As spring approaches and you begin to wash the salt from your trucks, take a few moments to consider what a person driving by one of those trucks might think about your brand. According to graphic designer, CEO and Creative Director of Graphic D-Signs, Inc., Dan Antonelli, you have about 2.5 seconds to make an impression on passersby. 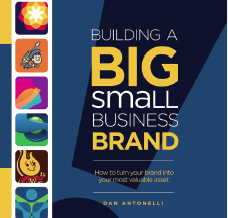 Like the articles Antonelli has written for us over the years, his latest book, Building a Big Small Business Brand, gets me thinking about branding – what it is and why it’s so important. Small businesses are spending more time, money, and effort on branding. It can get expensive, but it’s worth every penny. Chances are, your fleet isn’t plain white and hopefully it’s wrapped with your logo, company name, and contact information. But, with only 2.5 seconds to capture the attention of your audience, you need to stand out from the crowd! memorable, unique, and can be implemented consistently across all mediums (i.e., fleet wraps, websites, newsletters, coupons, etc.). Your brand is like an always-on ambassador working to pique the interest of your customers. But it goes beyond a logo. Your brand conveys your promise to customers. It establishes not just that you are an HVACR contractor, but what you value, be it timeliness, accuracy, reliability, accountability, money, etc. As potential customers see it around town, their trust in that promise increases. I know you sit down to read each HVACR Business issue as soon as it arrives every month. So, it’s probably not news to you that we’ve been preparing for our annual Tops in Trucks contest with a series on trademark and copyright law by attorney Ben Biftu. Trademarks — sometimes referred to as a company’s brand — distinguish your company’s products and services from those of your competitors. Getting that tagline, color scheme, or specific design on your trucks wasn’t free. If you’ve invested in branding or rebranding your fleet, be sure to protect your brand from corporate identity theft (trademark infringement). Our Tops in Trucks contest is designed to showcase the best branding in HVACR, to encourage our readers to think about their branding, and to highlight new trends in fleet design. The truth is, whether you have a fleet of 2 or 40 branded vehicles, your brand is out there, hopefully getting noticed by potential customers and competitors alike. If you’ve not protected your design with the appropriate registered trademarks, you might as well give the designs to the HVACR guy down the street. April is an exciting month for us, as we anticipate submissions to our annual Tops in Trucks contest. In its eighth year, the contest is an opportunity for you to share your truck designs with and be inspired by (but not breach trademarks of — see Ben Beniam’s article in this issue) your peers. Each year, we receive more submissions, and there are noteable improvements in design. If you are interested in submitting a design, please do so by April 30, 2014. For complete details, please visit www.HVACRBusiness.com/TopsinTrucks.